Wee….look at me, cooking again. Too fun, I want to learn more and more things to make. Yay! I had to turn the cooking and baking down a notch this week though. It’s one of the things I hate about being sick. Urgh. My immune system seems quite vulnerable this year. I’ve gotten sick so many times. So weird because I’m eating healthier these days. Oh life. I’m not a fan of cauliflower. But I am a fan of cheese. So I thought I’d give this a go. I like know how to eat things I’m not too fond of. This was the first time I cooked pork belly (obviously I’m not much of a cook. My repertoire consists mostly of pasta, fried rice and noodles—gotta change that, right?). I was going to use sausages instead but forgot to buy some. Good thing a pack of meat was left untouched in the freezer. Yay! For doing something new. Actually, this dish has a lot of firsts for me. First time with cauliflower, first time with pork belly, first time to make the white cheese sauce (roux? rue? roooooo? I don’t know..). Soo…another funny thing about cooking this. When I first made this (this is not the first time because the photos weren’t usable for the first try) I was really happy because it turned out so well- I cooked the meat just right and everything. It totally turned my day around. I screwed up my first try on macarons earlier that day so I was so pissed off for most of the day. So so freaking annoyed. I couldn’t even control my eyebrows from being so furrowed. Ack! I watched 5 hours of Global We Got Married (a reality TV show where celebrities from South Korea, Japan and Taiwan got paired up for a ‘virtual marriage’) on Youtube just to feel all cheery again. Nothing like watching good-looking people [kind of] fall in love, Hahha… I don’t usually watch Korean reality TV shows but when I do..I do it for hours and hours. Oh Marnelli. We all need comfort after some failure. I just choose to do it with bouts of Korean entertainment and a nice warm meal. I wanted to hug the cauliflower and pork belly. It’s easier than wishing for the ‘married’ couple I’ve been watching to just get together in real life. This dish was full of firsts for me. 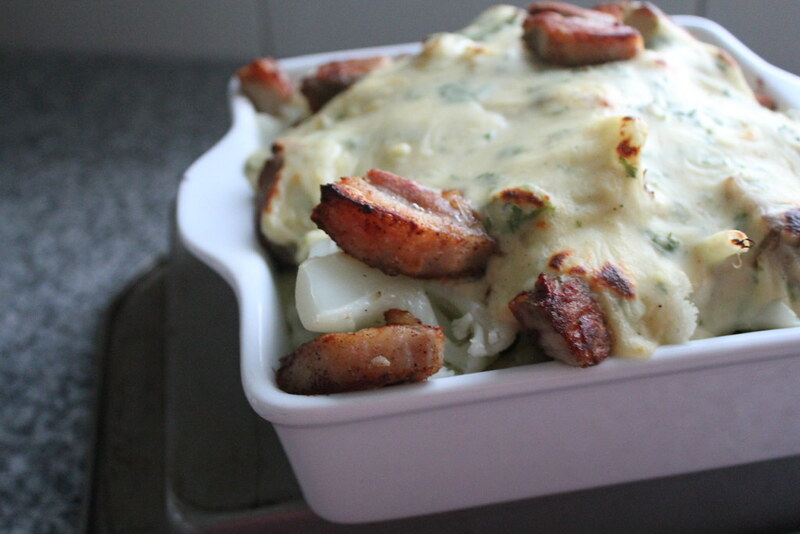 First time being obsessed over couple in reality TV…oh oops I mean.. you know..cauliflower, roux, pork belly. And it also pacified my feelings for failing another first (macarons) soooooo this seems fitting to add to the awesome monthly link party Our Growing Edge. This event aims to connect food bloggers and inspire us to try new things. This month’s host is Marija from Palachinka. PS. I’m hosting next month. Ehrmagerrrd. P.P.S. If you’re a Kiwi or living in New Zealand check out Sweet New Zealand #25 (which I’m hosting this month). – Bring a big pan of salted water to the boil and preheat the oven to 200 degrees Celsius. 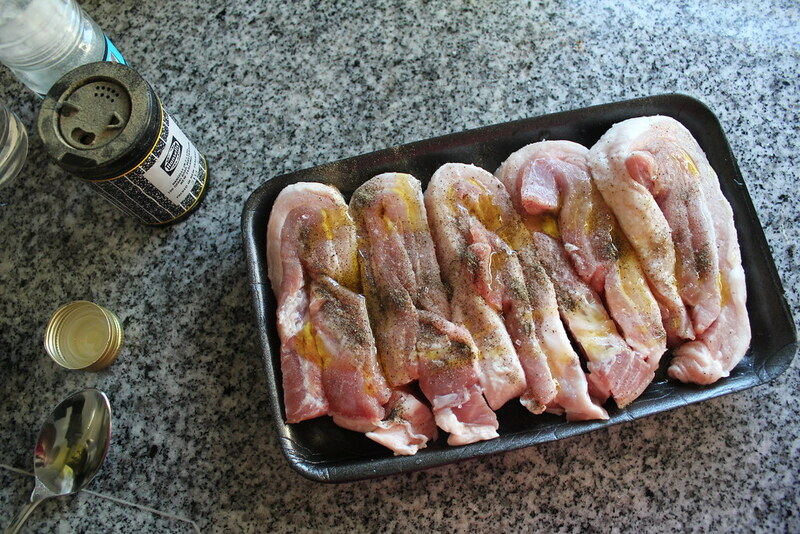 – Season the pork belly with salt and pepper and rub all over with the olive oil. – Heat an ovenproof pan until it’s hot then add the pork and cook on each side until golden brown then transfer the pan to the oven and cook for 5 minutes until the pork is just cooked through. 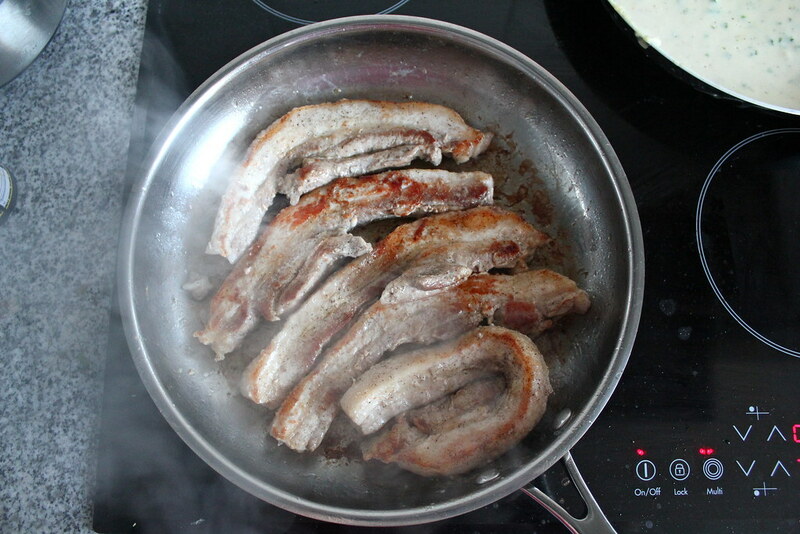 – Remove pan from oven and let the pork rest for 4-5 minutes. – In a different pan, melt the butter then dump in the flour. – Stir to a paste and cook for 1 minute over the heat as you keep stirring. – Pour in the milk, a bit at a time, making sure the milk is fully absorbed and bubbling before splashing in the next bit of milk. Lower the heat to a gentle simmer and cook the sauce for 2 minutes before seasoning. – Chop the cauliflower into smaller florets. – Lower them into the pan of water, bring back to the boil, and cook for 3-4 minutes until the cauliflower is just cooked. 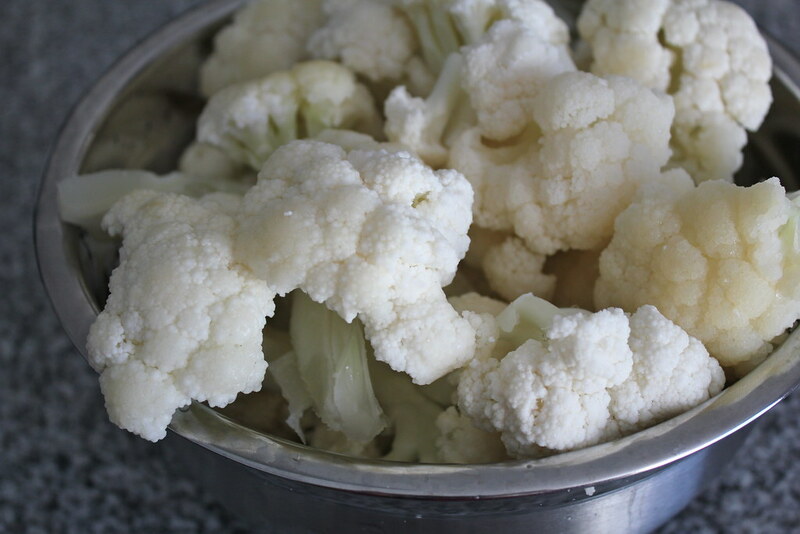 – Drain the cauliflower and allow to steam dry for a minute or so. 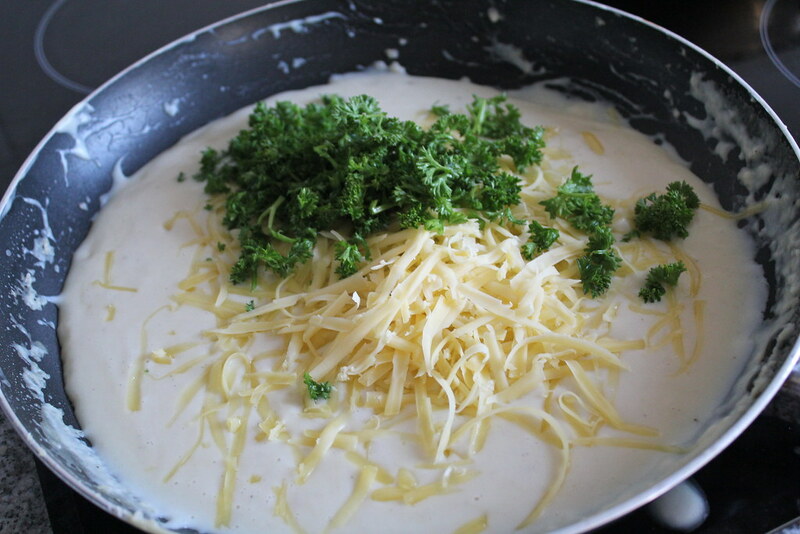 – Add the grated cheese and chopped parsley into the white sauce and stir to melt. – Slice the pork into small pieces with a knife. 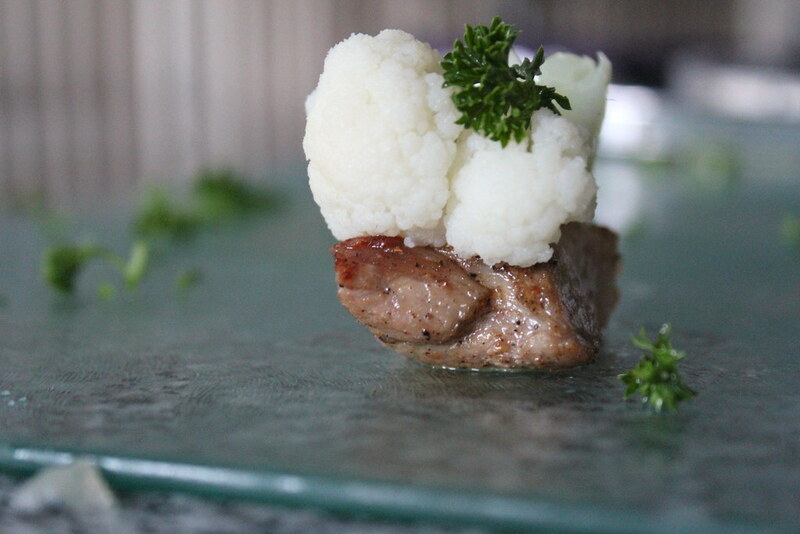 – Arrange the cauliflower and pieces of pork into a shallow oven dish and pour over the sauce. – Place the dish back into the oven for a couple of minutes until glazed and bubbling and the cheese on top has browned a little. Oh my wow. 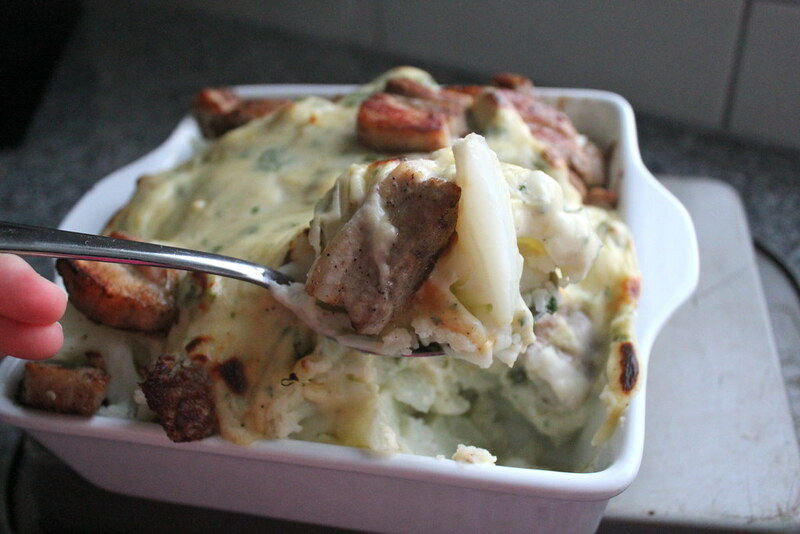 Great new recipe and thank you for submitting to Our Growing Edge. That looks amazing. 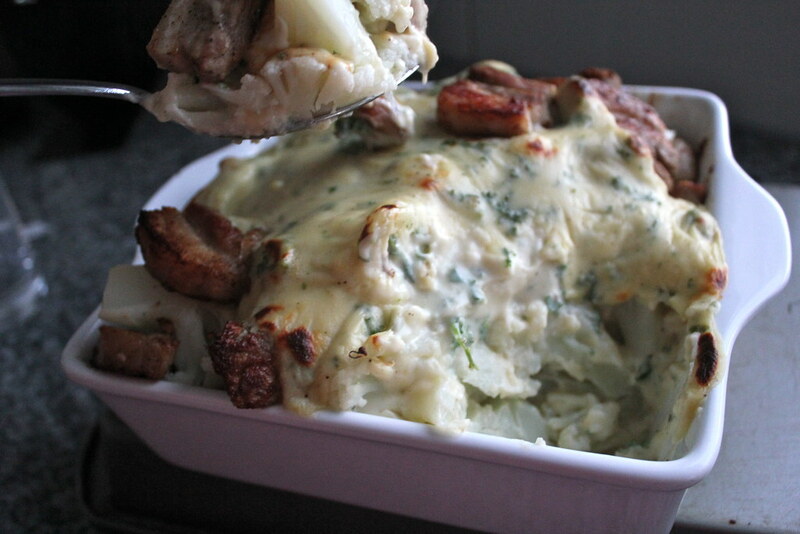 As if pork belly or cauliflower cheese weren’t swoon-worthy on their own, you just turned doubled the stakes. 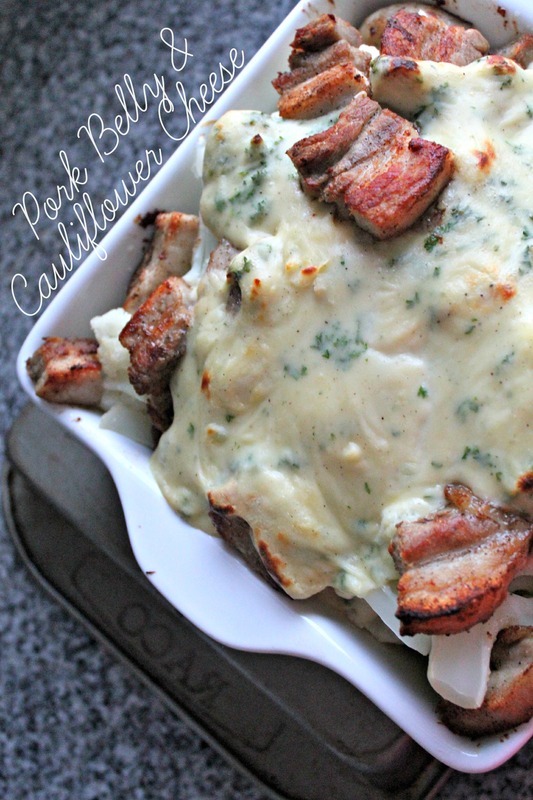 I made pulled pork not long ago and we had it with cauliflower and cheese sauce but pork belly is even better. I will certainly keep this in mind! this looks great! 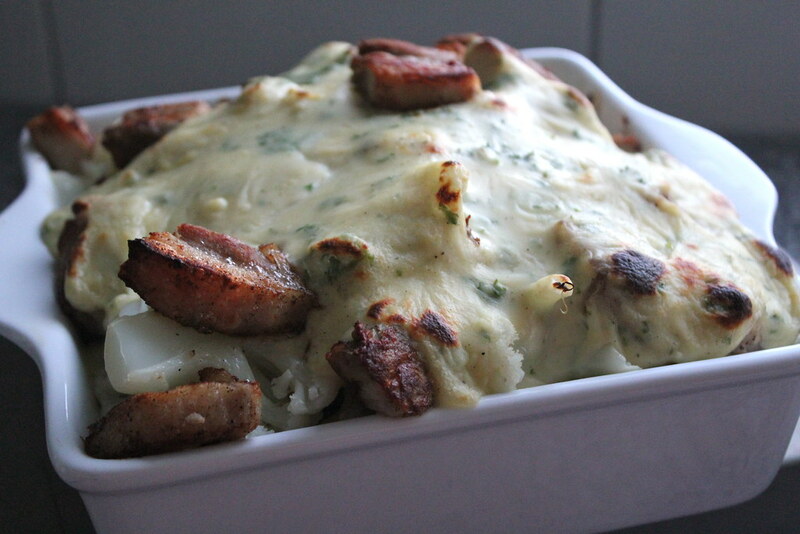 my partner will probably go crazy over it – thanks for the recipe!